Along with other fascinating comments, in this interview with Tom Snyder, Rand revises the age she discovered her philosophy of Objectivism to the age of a mere 2&1/2 years old - a big downgrade from the previous 12-ish she claims elsewhere. (at 8:08)Tom Snyder: When did you discover, or think up, or allow Objectivism to become your philosophy? Rand: From the time that I remember myself which was two and a half, the first incident I can remember in my life I was two and a half...and from that time on the the present I never changed my convictions - only at two and a half I didn't know as much as I know now, but the fundamental approach was the same. I've never had to change. This must surely be one of Rand's most bizarre, self-mythologising claims ever - and there's a fair bit of competition for that honour. For decades now, Rand's work has given comfort and ammunition to brazen bozos like Rush Limbaugh and McCain economic advisor Phil "Don't Worry Be Happy" Gramm. Its defense of selfishness and unrestricted capitalism provided an air of intellectualism to bad behavior and horrible policy. After graduating top of his class in 1870, ... Pareto worked as the director of a railway and the managing director of an iron and steel concern, the Società Ferriere d'Italia in Florence. While in Florence Pareto became increasingly frustrated with government regulators.... He sided with the radical democratic movements and the liberals whom, he believed, would replace privilege with meritocracy, restore real democracy, pursue free trade and true competition. Pareto made an unsuccessful bid for office on an opposition platform in 1882. In 1889, after the death of his parents, Pareto quit his job and moved to a villa in Fiesole... From his retreat, he began writing numerous polemical articles against the government and gave public lectures at a working man's institute. He was quickly targeted as a troublemaker by the authorities. Trailed by police, intimidated by hired thugs, his lectures were often closed down and his applications for teaching jobs blocked (incidentally, being well-trained with the sword, a crack shot with a pistol and equipped with an aristocratic sense of honor, Pareto never let himself be physically intimidated). [Pareto] would later take up economics and succeed Léon Walras at the University of Lausanne in Switzerland.] In a famous 1900 Rivista article, Pareto suddenly changed direction. Heretofore a radical democrat, Pareto now decided to declare himself an anti-democrat. The disturbances of the 1890s in Italy and France led Pareto to realize that, far from restoring true democracy, meritocracy and promoting social welfare, the radical movements were really just seeking to replace one élite with another élite, the privileges and structures of power remaining intact. The struggle was not for a good society, but a squabble among élites over whom exactly was to ... govern. And the ideals and theories they claimed to fight for? Just propaganda, Pareto declared, the way upwardly-mobile folks incite the helpless, hopeless mob to take to the streets on their behalf. For Pareto, humanitarianism, liberalism, socialism, communism, fascism, whatever, were all the same in the end. All ideologies were just smokescreens foisted by "leaders" who really only aspired to enjoy the privileges and powers of the governing élite. Pareto decided to have none of it—and went on a crusade to expose the sham of political ideology and doctrine. He condemned socialists of all stripes roundly in a 1902 book, but took particular aim at logically demolishing the "new gospel" of Marxian economics. For Pareto ... the promised "classless" society that would emerge under communism was merely ideological fodder for socialist leaders to lay on their flock. [Pareto’s] sociological observations also begin to indicate the future course of his ideas. In 1900, Pareto had entered into a brief controversy with Benedetto Croce. Croce had criticized economists' positivistic approach, particularly the assumption of "rational economic man". Pareto defended economists, but, at the same time, realized that the conventional defense was not even convincing ... to himself. Why did the predictions of economics fail to correspond to reality? Why were its policy recommendations, to him logically irrefutable, not adopted? The explanation, he concluded, echoing Georges Sorel, was simply that much of human activity was driven not by logical action, but rather by non-logical action. Pareto ... moved to Villa Angora in Céligny, near Lake Geneva... Pareto used his time at Céligny to write his Trattato di sociologia generale [known in English as The Mind and Society], which was finally published, after wartime delays, in 1916. This was his great sociological masterpiece. He explains how human action can be neatly reduced to residue and derivation. People act on the basis of non-logical sentiments (residues) and invent justifications for them afterwards (derivations). The derivation is thus just the content and form of the ideology itself. But the residues are the real underlying problem, the particular cause of the squabbles that leads to the "circulation of élites". The underlying residue, he thought, was the [most fruitful] object of sociological enquiry. If we focus on Pareto’s career, up until at least the late 1890s, we might be able to make something of an Objectivist hero out of him. After all, he was director of a railroad and steel concern, and he was a champion of economic freedom and an opponent of “intervention.” He fought to educate working man in the principles of freedom and even showed in courage in facing up to attempts by the government to intimidate and silence him. But in 1900, something happened to Pareto that made him much less the Objectivist hero. What happened? Why did Pareto suddenly lose all his idealism and become so “cynical” (as his critics claim) of human nature, particularly the human nature of political elites? The answer is really quite simple: it is yet another case of the proverbial “mugging by reality.” Pareto, from his own experience, found that trying to convince large numbers of people (whether workers, intellectuals, politicians, whomever) was a hopeless endeavor, and that his attempts to change the social order through arguments based on sound economic reasonings were a waste of time. Instead of trying to change society, he would seek to understand it. In his The Mind and Society, he examined literally hundreds of “theories, theologies, cosmogonies, systems of metaphysics, and so on,” with the idea of trying to “gain some knowledge of the forces which are at work in society — that is, of the tendencies and inclinations of human beings.” The result is an impressive compendium of the non-logical and non-rational in human nature. In four long volumes, Pareto builds a massive empirical case for the important role that "non-logical conduct" plays in human life and in the social order. By demonstrating the logical and empirical ineptitude of most of the theories put forth by intellectuals and philosophers, Pareto gave ample evidence that rationalization, rather than rational pursuit of truth, is what governs most of what passes for thought outside the hard sciences. After reading his massive treatise, it is difficult to ever again to swallow the romantic notion that social conditions can be changed by winning philosophical arguments. Dr Helen interviews three people who claim to be "going Galt." Apparently in reality this means anything from deliberately taking less well paying jobs through to giving up your health insurance (Shome mishtake, shurely? - Ed) to giving up smoking. Yes, really! Note: segment starts around 9 mins in. Starting Point. Fred Seddon, in his review of my book, Ayn Rand Contra Human Nature, chastised me for “not willing to consider ... normative political theory.” But as a matter of fact, I do consider it: I simply don’t consider it very highly. The trouble with normative political theory is that it too often degenerates into wishful thinking and unwitting rationalization. Those philosophers and social commentators who indulge in it become far more interested in defending their preferences than in understanding the political scene. What ought to be overshadows what is. Insight is sacrificed on the altar of advocacy. That is precisely where we find Rand’s politics: in a fool’s paradise of verbal reasoning. The following series of posts on “Objectivism and Politics” will seek to demonstrate this assertion. Stephen Colbert over at the comedy channel skewered Rand last week in a segment entitled "The Rand Illusion." As usual with Colbert, he is far more interested in drawing laughs than in being fair; he is, after all, a comedian, not a critic or philosopher. Colbert's best dig comes at the expense of John Reale, whose site goingjohngalt.org contains a solicitation for programming work. Galt steered the sedan around a wide curve, through a sun-flooded glen lined with aspens. Dagny leaned back, surrendering to the warm current of air that kissed her face. Then suddenly she jerked upright in her seat. "Stop the car! Oh, please stop!" Chuckling, Galt shifted into park. Dagny threw open the passenger door and leaped out, took two quick steps forward, then stopped, gazing in astonishment at the tall, gaunt figure who stood before her on the side of the road. "It's you, isn't it?" she whispered. "You're here in Galt's Gulch, too." "Why, yes, Miss Taggart," the man said with a knowing smile. "We all know you, if only by reputation. But I'm surprised you know me." "Of course I do. You're Will Koch, CEO of Holiday World & Splashin' Safari, the last of the fully rational theme parks." Will Koch inclined his head gravely. "I used to go there every summer," Dagny said breathlessly. "I would ride the giant water slide and swim in the endless pool - always wearing my Holiday World water wings, of course. It was my refuge from the looters and the hell they'd made of the world." "As it was meant to be," Will Koch said. "We had a strict no-looters policy. Anyone who had accepted government funds for any reason was barred from admission. I refused to allow my water slide and the other attractions, the products of my intelligence and my dedication to reality, to serve the amusement needs of the parasites and moochers. But when the government told me I had to stop screening visitors and admit anyone with the money to pay - regardless of the source of that money - then I knew I would have to close the park. It was the hardest decision I've faced in my life. I'm honestly not sure I could have gone through with it on my own. But that night, as I sat alone on one of the giant lily pads long after the park had closed, out of nowhere he appeared." He nodded toward Galt, still seated behind the wheel of Midas Mulligan's roadster. "By the time he finished speaking to me, dawn was breaking ... and my decision didn't seem so hard anymore. I took a last walk through the Jungle Jim Maze and left that park and never looked back." "But how can you stand it?" Dagny moaned. "Leaving it all behind?" Will Koch smiled, a radiant smile of morning, the smile of a child awakening on a perfect summer day. "Oh, but I didn't, Miss Taggart. I brought it all with me. The plans, the blueprints, the marketing strategies, all of it." He tapped his forehead. "I carry them here. And now, here in this valley, I'm building a new Holiday Park and Splashin' Safari theme park, a recreation place for the men of the mind - and only for the men of the mind. It will be my gift to the producers of society, and my monument to them - a more lasting monument than anything I could have built in the looters' world. It's the proudest accomplishment of my life. Would you like to see it?" "It's right over there," he said, pointing to a small mud hole, three feet wide and six inches deep, ringed by disorderly piles of sapling branches. "Oh." Dagny felt a brief plunge of disappointment. "It's a bit small, isn't it?" "Well, what the hell do you expect? I'm a CEO, Miss Taggart. I've never worked with my hands in my life. I don't have a clue how to actually build anything. I got the job because I know how to schmooze the shareholders at the annual meeting. That's how all of us got our jobs. Besides, it would take a small army of construction workers to build an actual theme park, and we have no construction workers in Galt's Gulch. No sanitation workers, either - but that's another story. You don't really believe that a handful of disgruntled corporate executives could build a theme park, much less a whole community, without the proper equipment, training, or skills, do you? Only a small child would buy a crazy story like that." "Yes," Dagny said, accepting the hard, bright logic of his words. "Yes, of course you're right." Will Koch smiled. "So ... would you like to go for a dip?" [T]he Objectivist ethics is the moral base needed by that politico-economic system which, today, is being destroyed all over the world, destroyed precisely for lack of a moral, philosophical defense and validation : the original American system, Capitalism. We’ll ignore whether the statement about capitalism being “destroyed all over the world," which, even if it were true when Rand made it, is hardly true any more. Our focus instead regards Rand’s view of “moral base” or moral foundation. What Rand means by moral base is a set of ethical arguments that can be made on behalf of capitalism. She is declaring that Capitalism requires moral rationalizations to survive. She appears to believe that if these rationalizations are good (i.e., logical and “rational”), capitalism can survive. If the rationalizations are bad (i.e., illogical and irrational), capitalism cannot survive. In other words, the survival of capitalism depends on how it is defended verbally. The answer is decidedly in the negative. And at this point we emphatically draw a dividing line between ourselves and … a school which we can hardly call by any other name but liberal anarchism, if we reflect that its adherents seem to think that market, competition, and economic rationality provide a sufficient answer to the question of the ethical foundations of our economic system. What is the truth? The truth is that … we have made it abundantly clear that we will have no truck with the sort of economically ignorant moralism which … always wills the good and works the bad [i.e., “socialism” in the broad sense of the word]. But we must add that we equally repudiate morally callous economism [i.e., capitalism based on self-interest], which is insensitive to the conditions and limits that must qualify our trust in the intrinsic morality of the market economy. Once again, we must state that the market economy is not enough…. Rand, it goes without saying, would have strongly disagreed with Roepke. She had no use for traditional values or such things as “public spirit” and “connection” with community. Nor would she have approved of putting limits on greed. 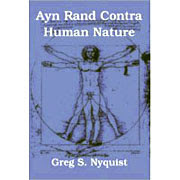 For Rand, greed is good, and any limits on greed are merely gratuitous concessions to altruism and “self-sacrifice.” She regarded “trade” as “the only rational ethical principle for all human relationships, personal and social, private and public, spiritual and material,” She would probably have disagreed with Roepke’s assertion that society “cannot be ruled by the laws of supply and demand [i.e., by trade].” Nor would she have been willing to accept any limits on her precious ethical principles. Who is right on this issue? Is it enough to convince everyone they ought to be selfish? Could a society based primarily on enlightened self interest and Rand’s “trader principle” lead to greater wealth and happiness for individuals and society? Or would it simply bring about moral degeneration and collapse? The evidence strongly suggests that Rand is wrong on this issue: that society cannot be based solely or primarily on enlightened self-interest and the trader principle. The majority of people are not rational, and self-interest, if left to its own devices, quickly degenerates into predatory behavior. Consider Enron, for example. Enron was governed by self-interest and greed. Jeffrey Skilling, Enron’s Chief Operating Officer, believed that “all that matters is money… You buy loyalty with money. This touchy-feely stuff isn’t as important. That’s what drives performance.” And so Enron was run merely as a money making machine by people lacking the “ethical norms” that come from community and tradition. “You were really less thought of if you got a percentage, even if it was 75 per cent of your annual base pay,” noted one ex-employee. In tapes that became public in 2004, Enron employees are heard asking electric companies to shut down production in order to maintain prices. And why shouldn’t they have cut power to increase profits? After all, it was in their self-interest! Another exchange involves “all the money you guys stole from those poor grandmothers of California.” In yet another tape, Enron traders watching a California wildfire are heard shouting “Burn, baby, burn." It was in Enron’s self-interest for California’s electrical infrastructure to be seriously damages by fire: so let it all burn, regardless of who gets hurt (or even killed). Self-interest, it turns out, is not always so benign. Nor can it be counted upon to make people honest or benevolent toward others. Morality cannot depend, as it does in Rand’s Objectivist philosophy, on self-interest and verbiage about honesty. Arguments about the “rational” self-interest of honesty will not convince people to refrain from defrauding and harming others. If the institutions of society don’t instill the values of honesty and empathy for others into the very moral fibre of the individual, “rational” arguments will prove useless. Seems like the whole "Going John Galt" meme currently going around the interwebs is not so new after all (we've already commented a few months back). Take this heart-rending story from all the way back in post-Enron 2002, where businessmen in Kansas were apparently feeling so victimised they had to form a kind of Randian support group - where they "fantasized of a modern-day strike of thinkers and creators". "We are the producers of society," says Will Koch, CEO of a development company that owns the Holiday World & Splashin' Safari theme park in Santa Claus, Ind. That was seven years ago. When will all these wannabe-John Galts get around to actually leaving? Earlier this week skeptic Michael Huemer debated Rand's ethics with the ARI's Onkar Ghate. Audio here. Give us your score for both sides in comments. In the early years of the London insurance market, it was possible to buy a life insurance policy on a complete stranger. Then insurance companies noticed the high incidence of unexpected homicides among their lives assured, and the concept of insurable interest was devised, codified by the Life Assurance Act of 1774. Today, you can’t buy a life insurance policy unless you can demonstrate some loss by the assured party’s death. The business is safer that way! As a minimum, therefore, CDS writing should be restricted to those holding bond, loan or swap obligations against which CDS might reasonably hedge. CDS should be distinguished from stock short positions and stock options (which have similar theoretical possibilities) because their greater leverage and higher outstanding volume make them uniquely dangerous. Such a market would be highly illiquid, but it would fulfill CDS’s essential function of enabling credit risk transfer. CDS’s other advantages, of demonstrating credit spreads over a public marketplace, allowing the hedging of baskets of similar credits, providing an instrument for hedge fund “investment” and making huge returns for the major dealers, would be lost. However, CDS’s destabilizing effect on global financial markets would also be lost, and the cost to taxpayers of rescues for those major institutions which had either got the CDS market wrong or were victims of CDS “bear raids” would be eliminated. The free market is a wonderful thing. However, allowing unrestricted free markets in everything, without regard to the real-world economic effect of those markets, is a Whig shibboleth similar to the “Repeal the Corn Laws” unilateral free trade policies that destroyed Britain’s economic strength in the 19th century. The great and economically highly sophisticated Tory Prime Minister Robert Lord Liverpool, a generation prior to the mid-century free traders, also believed in free markets, but was a realist in their application to the world in which he lived. The real world is messy and does not conform to simplistic equations either mathematical or moral. The wise policymaker will legislate accordingly, providing the maximum market freedom but inserting restrictions where the temptations to malfeasance are too great. The CDS market forms an open and shut case for restrictive regulation. Uncertainty. Central to the Objectivist philosophy is the notion that certainy is possible. Rand went so far as to suggest that the denial of certainty “means that no knowledge of any kind is possible to man, i.e., that man is not conscious.” It is also generally believed among the Objectivist faithful uncertainty, or “skepticism,” is a morally deplorable philosophical position, an epistemology that paves the way for dictatorship and tyranny. Idea X is “certain” if, in a given context of knowledge, the evidence for X is conclusive. In such a context, all the evidence supports X and there is no evidence to support any alternative. It should be clear that the problem of hidden or absent data ... affects the kinds of inferences we draw and the beliefs we have about everyday life. Oftentimes, the lifestyles we lead, the roles we play, and the positions we occupy in a social network deny us access to important classes of information and thus distort our view of the world. Another source of hidden data relates to all estimates dealing with the possible outcomes that arise from choices made by human beings. Since human beings exercise volition, it is impossible to know for certain how they are going to behave. Action within a social context magnifies this uncertainty. How, for example, will Obama’s “stimulus” package affect the economy? Since our estimate depends on attempting to figure out how the stimulus will affect thousands of people whom we don’t even know, to regard any such estimate as “certain,” even in the odd Objectivist sense of the word, would be ludicrous. Yet nearly all non-trivial judgments about economics and business are tainted with this uncertainty, since they all involve guessing how people will behave in general situations that are assumed to arise from a given policy. Take as an illustration any typical business decision. A manufacturer is considering the advisability of making a large commitment in increasing the capacity of his works. He "figures" more or less on the proposition, taking account as well as possible of the various factors more or less susceptible of measurement, but the final result is an "estimate" of the probable outcome of any proposed course of action. What is the "probability" of error (strictly, of any assigned degree of error) in the judgment? It is manifestly meaningless to speak of either calculating such a probability a priori or of determining it empirically by studying a large number of instances. The essential and outstanding fact is that the "instance" in question is so entirely unique that there are no others or not a sufficient number to make it possible to tabulate enough like it to form a basis for any inference of value about any real probability in the case we are interested in. The same obviously applies to the most of conduct and not to business decisions alone. Knight’s point about the uniqueness of a given situation is an important insight: each instance is unique because (1) of the inordinate complexity of any given social situation and (2) because the outcome of a given decision or policy must depend on how a great many individuals react to it, and it is impossible to have certain foreknowledge about those reactions, because people have volition. Now Rand believed that innate tendencies don’t exist. If she were right about this, it would be impossible to make any kind of rational estimate about human behavior, and social science would be a futile exercise. Fortunately, Rand was wrong on this issue: human beings do have innate tendencies, and from these innate tendencies one can fashion estimates or guesses as to what is likely to happen under a specific set of conditions. But these estimates are only guesses. Even when such estimates enjoy a high degree of “probability,” it would be gratuitous to regard them as certain. So when Objectivists declare that the current crisis was caused solely by government interference, they are at best making only a guess. They can’t know such a thing for certain. Nor would such a claim constitute a particularly good or even probable guess, since some of the worst financial dysfunction occurred in the least regulated markets. To sum up: even if certainty were possible, it would hardly matter, because most of things people argue about in economics and pubic policy are not capable of meeting even Objectivism's standard of certainty. Most of the things people argue about can never be known with certainty. If certainty could be attained, there would exist a consensus among the intelligent and the rational. Where no such consensus exists (as on most issues relating to social and economic policy), certainty is also, in all likelihood, impossible.